This year we’ll be more considerate of food waste and the source of our food products, as environmental concepts such as the "root to stem" process are set to continue into 2018. 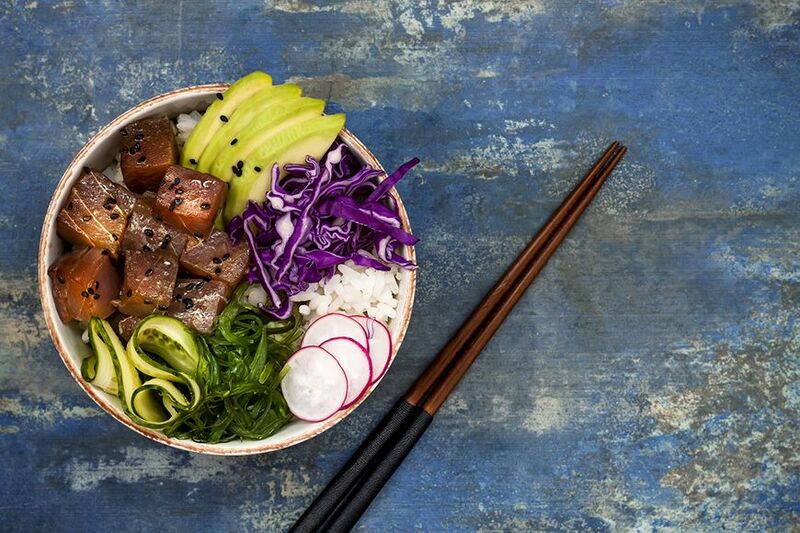 Hawaiian food is on the rise this year, as poke bowls could be your new favourite dish. An everyday food in Hawaii, poke bowls are a raw fish salad served as an appetiser or main course. If you’re a sushi lover then you’ll want to try these, as they’re basically a bowl of sushi with a Hawaiian twist. Customisable to suit your tastes, poke bowls are also economical and surprisingly filling. Gut-friendly food will feature prominently in 2018, as fermenting, pickling and preserving are the way forward. You’ll start to hear about probiotics like kimchi, miso and kefir and prebiotics such as onions, garlic and other alliums, which all have health benefits and help healthy digestion. Middle Eastern spices like Turmeric, harissa, cardamom and za’atar are becoming main stream, as dishes like shakshuka, grilled halloumi and lamb are also popular. Health experts are encouraging Middle Eastern foods as they are known for keeping the body healthy and helping with cardiovascular problems. The food is still full of flavour without excess salts, sugars and fats. Other Middle Eastern cooking ingredients include pomegranate, eggplant, cucumber, parsley, mint, tahini, tomato jam and dried fruits. Turmeric, which started to trend in 2017, has anti-inflammatory powers, as the super herb boosts the body’s defence system, helps gut health and even eases joint pain. More shops and restaurants will start to promote the food industry’s "root to stem" concept, in 2018. The idea involves using ALL of the vegetable or animal so that food waste is minimised and climate change is considered. By using the entirety of the vegetable you are wasting less food and therefore helping the environment, it’s that simple and so is an easy step to try in 2018. Tea is starting to become just as big as coffee, with more tea bars and cafes opening worldwide. The sales of herbal and green teas are also increasing, with many new tea varieties and flavours constantly entering the market. Therefore, there has been a growing appreciation of tea and its apparent health benefits. Plant-based proteins such as tofu, tempeh and quinoa are on the rise, as is veganism and vegetarianism. Restaurants are therefore taking dishes back to their plant-based roots and have started to experiment with new flavours and ingredients to try to be meet-free in 2018. Timut pepper is one of the new seasonings we’ll be exploring this year, but beware it’s got a kick to it! Originating from Nepal, this zesty spice has a hint of grapefruit to it and particulary works well with drinks. We’re familiar with non-alcoholic restaurants and drinks in the UAE, however it appears that alcoholic free beverages are set to trend worldwide in 2018. As a health conscious food and drink industry is circulating this year, more people are opting for mocktails, sparkling waters with interesting flavours and fruit cordials with botanical mixes, over alcoholic options. Another one for the healthy eaters, nootropics are brain food, as the trend to eat well for brain power, ability and concentration could overtake the gut health trend. Foods such as salmon, eggs, turmeric, dandelion greens and jícama (Mexican yam) are all on the brain food list for 2018’s clever consumers. Green juices and smoothies are being swapped for drinkable soups in 2018, which are more filling and often have more flavour. With organic antioxidant-packed produce,drinking soups are the new way to get your five-to-ten servings of healthy produce each day. Just as South America gets more popular with travellers and tourists, so does its food! Expect to see Mexican, Peruvian and Brazilian foods along with a Japanese-Mexican fusion, in 2018. Traditional South American ingredients such as quinoa and chia seeds have peaked, but purple potatoes, white and purple corn, black quinoa and kiwicha seeds are becoming increasingly more known and used. We can’t wait to taste some of the flavours that this food trend will bring!